This technique is very free form. 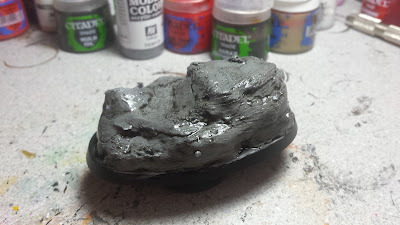 You'll be using the washes to create the underlaying stone colors. Don't worry about being neat with your washes, you want some overlap between colors. Each step is going to be thin, you want each color to lay over the other and interact, not overpower. I mix all my paint with Liquitex Matte Medium and water. My washes are mixed with plain water to help thin them out. 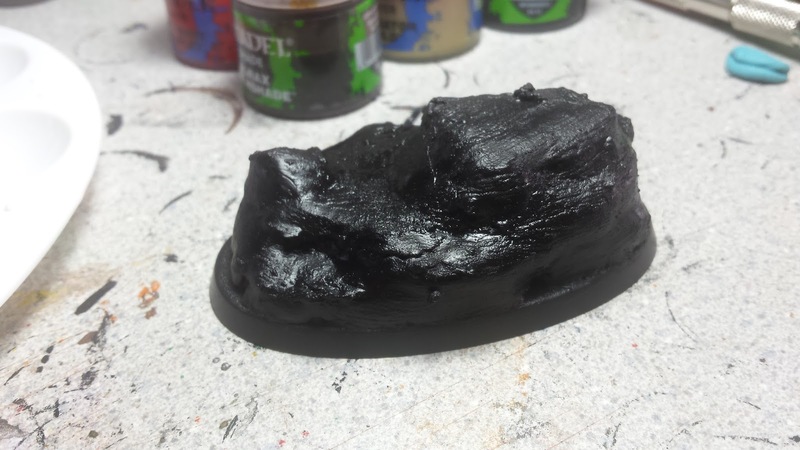 First up, now that the glue is dry from the last step in the previous tutorial, we prime it with black spray paint. 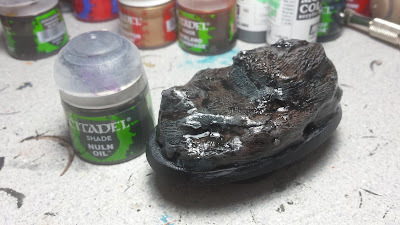 I use Citadel's Chaos Black, but you can use other brands. And since we didn't use any pink foam in the building of the rock, we don't have to worry about it melting. For this rock, I am base coating the rock in Neutral Grey. 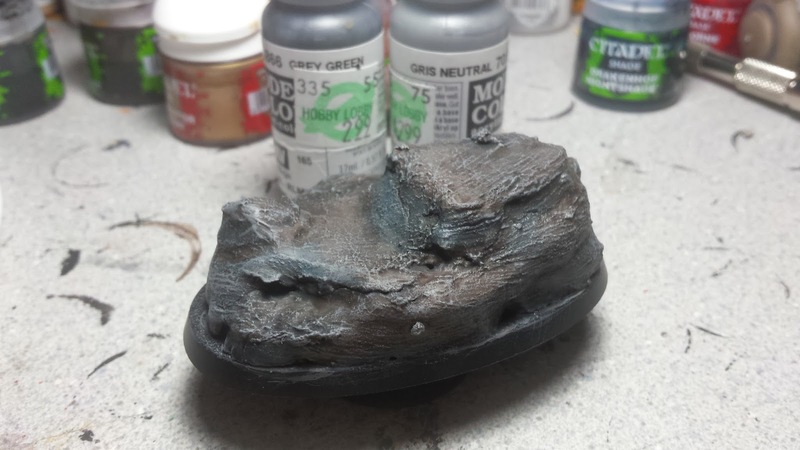 Don't worry about making the base coat fully opaque. I did 2 coats on this one, but a lot of the time I let the paint streak more. 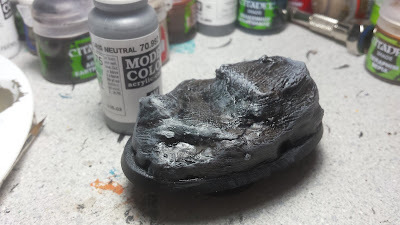 With the paint fully dry, its time to wash it with Nuln Oil. Make sure every nook and cranny is covered. This is meant to help enforce the texture of the surface before we start with the other colors. With this step done it's now time to sitting and wait for it to dry. 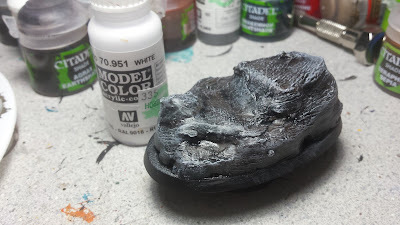 You want it fully dry before you begin the next wash.
With the Nuln Oil wash dried, was start picking out areas to paint with our first wash. For this step I'm using Drakenhof Nightshade. I try to simulate strata in the rock's surface by painting the wash on in horizontal and random width lines. For this step, I painted over the wash three times until I was happy with the color depth, waiting for each layer to dry fully before adding another. For the next layer of strata I switch colors and this time add in some Riekland Fleshwash. 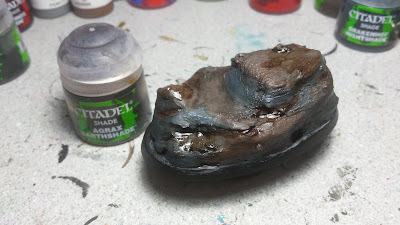 I also make sure to cover the edge and a bit of the previous wash with the new color to help tie them together a bit. Finally I cover the remaining grey areas with Argax Earthshade and I also pick out a few other areas that are already painted with previous washes as well. For this wash I did 3-4 layers to make it darker and to help differentiate it from the Riekland Fleshwash. With all the washes fully dry, it's time to wash it with Nuln Oil again to help the recesses show again. 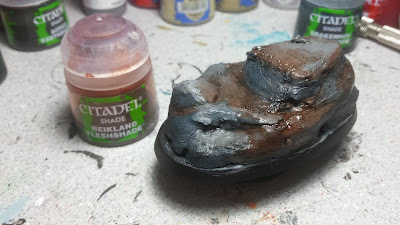 I make sure to just do a thin wash, rather than a dark and heavy wash. Since we don't want to hide the colors of the other washes too much. 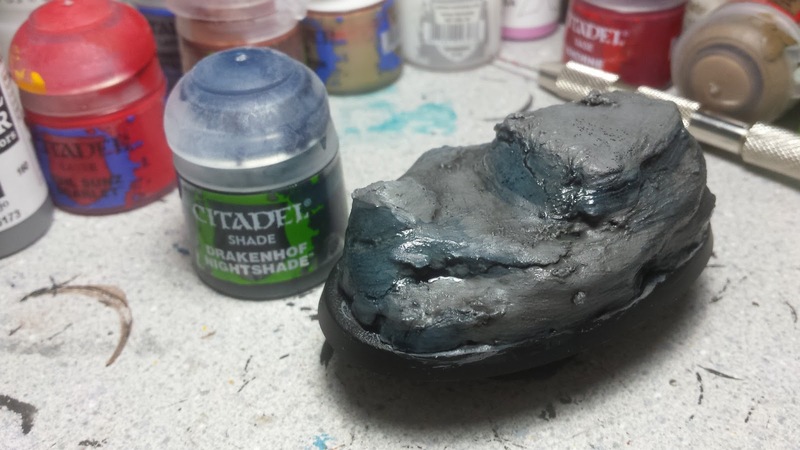 Using a mix of roughly 1:1 Grey Green and Neutral Grey we use a flat brush and lightly drybrush the entire surface. The main goal is to pick out the texture details a bit. Try to keep the layer a bit light as well, since we're going to be doing two more drybrushings after this as well. 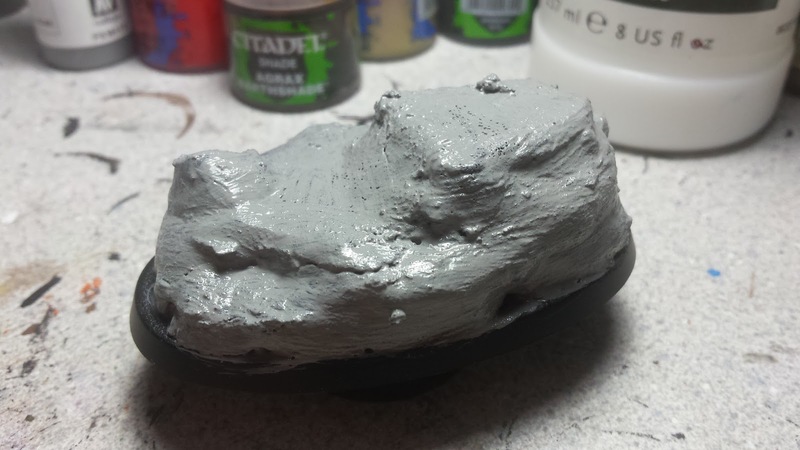 After the first drybrush, we follow up with a second light drybrush of Neutral Grey over the higher areas, leaving the recesses with only the previous drybrush. 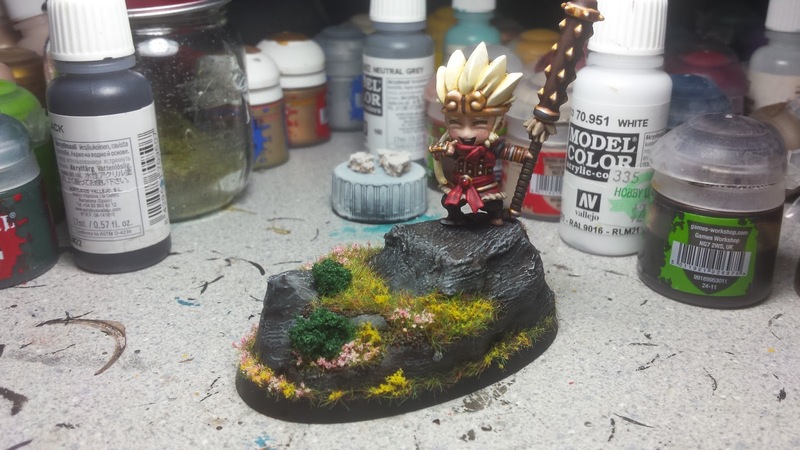 Finally the last drybrush is done with white on the highest points and edges of the rocks. And that's it! We now have a rock with more interesting color depth than just painting it black and drybrushing it with greys and white. With a few extra details, this base transforms from a bland slab of stone into a landscape of color. This is Son Goku from Ninja All-Stars, expect a showcase post about him soon. Until next time, and thanks for reading! Great tutorial Scott. The drywall filler really works well for the texture. The Nightshade and Fleshshade also do a great job of creating some interesting variation underneath the dry brushing. The step you are killing me on though, is going from the barren rock to a wonderland of grass and flowers! Ya I tried drywall filler after I found cracking pink foam to be unappealing to me. So I grabbed a cheapo brush and a container of drywall filler to see what happened. From there I just started playing with different stuff to see what happened. Such a lovely job Scott! That is a fantastic lookin rock!